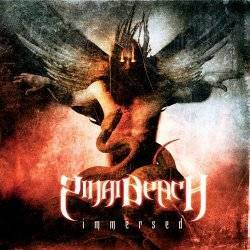 I'm not familiar with the two first Sinai Beach albums, but Immersed, their third one, is a real neck breaker. Sinai Beach could be seen as just another band on the trendy metalcore market, but listening more closely shows that they are not a band sounding like the rest. The two vocalists set Sinai Beach apart from the competition. They don't act the cliché "good cop, bad cop" or "the beauty and the beast", but found a more strange orientation. Most parts feature Courtney Alderson as a tough guy sounding like Pantera's Phil Anselmo. But there are lots of melodic parts creating a link to Glenn Danzig. The opener Obedience Though Desecration is a fierce and brutal track, showing how intense their music can be. Catchy riffs and ear pounding drums contribute to raise Immersed above the overcrowded metalcore genre. Especially Return To Dust and Hell Blaze are two very impressing tracks that blast your ears away. Some songs also contain samples, or industrial and electronical intros to make things more diverse. The impeccable production has been overlooked by Eric Rachel has already worked in the past together with top acts like Dillinger Escape Plan, Atreyu and God Forbid. Very unusual is that such a brutal metal combo is part of the American Christian music scene, but song titles like The God I Would Be and To The Church have already hinted at this idea. Even if I don't like that ideology, the music on Immersed is far above average.